[Update June 20: If you are interested in a "Cash for Clunkers" trade in, it is useful to know that the gas savings from a trade in can be worth more than the Cash for Clunkers voucher. See this post for various tools for calculating your gas (and cost) savings of trading in a lower MPG car for a higher MPG car. Here are the details on the May 5 compromise Cash for Clunkers. The press release is below. See the blog archive on the right for older and newer posts on Cash for Clunkers. One plus: It has increasing rebates for larger MPG improvements. One minus: The MPG jumps required for a large light-duty truck are quite small. 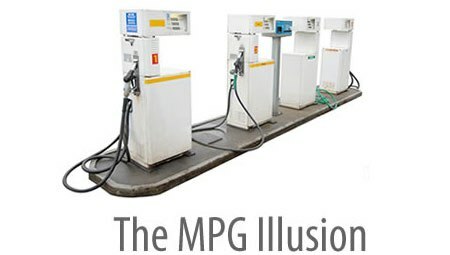 Of course, GPM shows that even small MPG jumps can produce decent gas savings when they are applied to really inefficient trucks (e.g., 12 MPG to 15 MPG improvement saves almost 200 gallons of gas per 10,000 miles). But the structure would allow people to qualify for vouchers for 1 MPG increases (e.g., 15 MPG to 16 MPG, which saves only 40 gallons of gas per 10,000 miles) that yield small gas savings. The 15 to 16 MPG improvement would qualify for a $3,500 voucher. Overall, the carbon payback--as discussed in an earlier post--will tend to be pretty long if people make the minimum MPG improvement in their category. From a greenhouse gas perspective one has to then hope that many people will go beyond the minimum. The press release appears below. I've added my own "GPM" translations in brackets [gallons per 10,000 miles] and some examples in italics following each vehicle category. Consumers may trade in their old, gas-guzzling vehicles and receive vouchers worth up to $4,500 to pay for new, more fuel efficient cars and trucks. The program will be authorized for up to one year and provide for approximately one million new car or truck purchases. The agreement divides these new cars and trucks into four categories. Miles per gallon figures below refer to EPA "window sticker" values. Passenger Cars: The old vehicle must get less than 18 mpg [555 GPM] . New passenger cars with mileage of at least 22 mpg [454 GPM] are eligible for vouchers. If the mileage of the new car is at least 4 mpg higher than the old vehicle, the voucher will be worth $3,500. If the mileage of the new car is at least 10 mpg higher than the old vehicle, the voucher will be worth $4,500. Light-Duty Trucks: The old vehicle must get less than 18 mpg [555 GPM]. New light trucks or SUVs with mileage of at least 18 mpg are eligible for vouchers. If the mileage of the new truck or SUV is at least 2 mpg higher than the old truck [e.g., 20 MPG, which is 500 GPM], the voucher will be worth $3,500. If the mileage of the new truck or SUV is at least 5 mpg higher than the old truck [e.g., 23 MPG, which is 434 GPM], the voucher will be worth $4,500. Large Light-Duty Trucks: New large trucks (pick-up trucks and vans weighing between 6,000 and 8,500 pounds) with mileage of at least 15 mpg [666 GPM] are eligible for vouchers. If the mileage of the new truck is at least 1 mpg higher than the old truck, the voucher will be worth $3,500. If the mileage of the new truck is at least 2 mpg higher than the old truck, the voucher will be worth $4,500. The value of this one all depends on how bad the original vehicle is. Some GPM gains are small. Mileage improvement of at least 1 mpg or trade-in of a Work Truck.